I wanted to get up to speed with the latest Municipal Development Plan for the city so I popped into the free workshop presented by the Federation of Calgary Communities and the city. I've been to a few of these and highly recommend them - you meet the most interesting people and find out about the workings of your city all at the same time. Intended to give a general overview on the somewhat unwieldy document (actually two documents) the workshop introduced us to Plan it Calgary - the process (not the document) for developing an integrated Municipal Development Plan (MDP) and Calgary Transportation Plan (CTP) that the city will (may?) be implementing shortly. How close they follow the plan is subject to mayoral election coming this fall. Some of you smart readers have probably already heard about it, but for those who may not of, or for those who have heard of it but could still use a few pointers to help with navigation, here follows a brief overview. 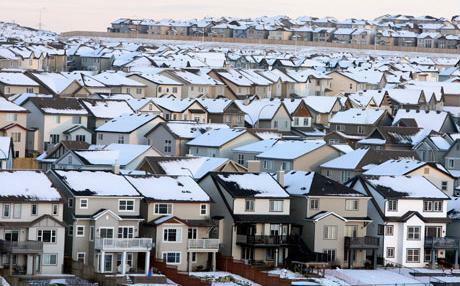 Back in 2005, the city initiated imagineCalgary, a visioning exercise open to all Calgarians. Here was an opportunity for all those with active imaginations to tell their story about what they wanted their city to be like in the next 100 years. Did you want Jetson-like spaceship launching pads from every home or a wildlife petting zoo downtown? If you could imagine it, it could be documented. I put in a couple of brilliant (I thought) ideas but have noticed none have come to fruition. In their defense, they did say 100 years. From the ripe imaginations of Calgarians came the more down-to-earth (no Jetson landing pads) integrated land use and mobility plan, which was given council approval in 2009. Can we pause for a moment to make note that this is the first time that the transportation plan and the city development plan were developed together as a unified integrated plan. How, you ask, can you possibly plan one without the other? Good question. Needless to say, I give thanks to those who made this happen. Better late than never. One of the informed City facilitators posed the question "How can Calgary grow up, not just out?" Amen sister. 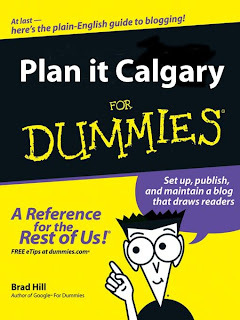 I'm hoping it's with processes like Plan it Calgary. 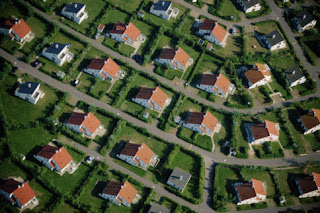 Grounded in the philosophy of Smart Growth, Plan it starts with 11 principles: 1/ create a range of housing opportunities and choices, 2/ create walkable environments, 3/ foster distinctive, attractive communities with a strong sense of place, 4/ provide a variety of transportation options, 5/ preserve open space, agricultural land, natural beauty and critical environmental areas, 6/ mixed land uses, 7/ direct and manage redevelopment opportunities within existing areas, 8/ support compact development, 9/ connect people, goods and services locally, regionally and globally, 10/provide transportation services in a safe, effective, affordable and efficient manner that ensures reasonable accessibility to all areas of the city for all citizens and 11/ utilize green infrastructure and buildings. This might be a good time to mention how it differs from Smart Growth. Even with only 10 key principles, Smart Growth offers a tad bit more. I might add that what is missing may compound some of the same issues currently plaguing Calgary further into the future. Two key principles conspicuously absent from Plan it include providing an urban containment boundary to protect and enhance endangered agricultural lands and to stop urban sprawl. In an earlier blog I mentioned that Portland did this with much success. Why are we so squeamish about making it a key principle? What might have been an innocent oversight, also missing from the list of principles in Plan it is to nurture engaged citizens, knowing that places belong to those who live, work and play there. Engaged citizens should be encouraged to participate in community life and decision- making. In general, Smart Growth-ers would prefer that we stop building on Greenfield (fresh land) all together and densify what we've already built. This is a great way to stop sprawl. Alternative development on old Brownfield (former or current industrial sights) or even Greyfield (former or current commercial sights) is another option. Green, brown, grey - are you following me with all these colours? City council, with some say pressure from suburban developers, made a last minute amendment to the original Plan it document, relaxing the density targets for Greenfield development to 60 residents/jobs per hectare down from 70 residents in the original plan. The good news is that the rest of the plan went forward as designed. The bad news is we still seem to be afraid of ticking off those who wish to expand our footprint. In both Plan it and Smart Growth, the focus is on intensification and diversification of key urban activities, with a huge emphasis on improving the myriad ways in which we move around, be it by bike, foot, public transit or car. Nothing would make this happy urbanist happier than a segregated bike lane throughout the city's urban core! Or how about a five minute wait for the C-train even during non-peak hours? 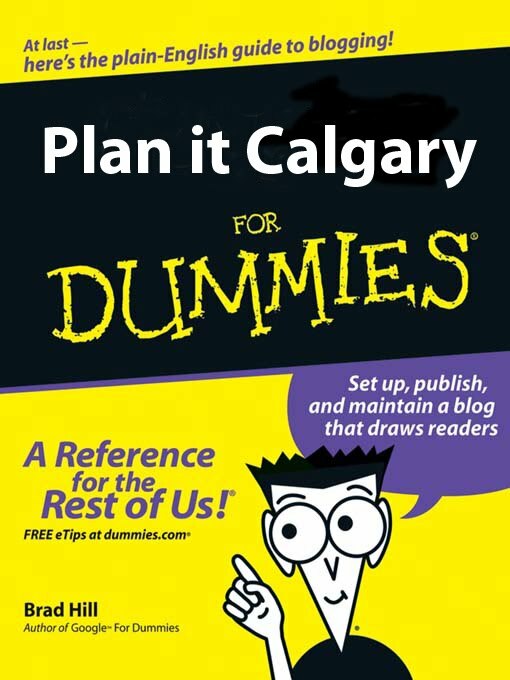 Plan it Calgary acknowledges an account reporting called the triple bottom line. Where traditional accounting models focused solely on profit, the triple bottom line calculation includes two other key factors - people and the planet- often the bearers of the hidden costs of all that profit making. It has now been recognized that if you don't factor all three into the equation, you have a false economy. In a 2009 article on Plan it in Fast Forward, Ben Brunnen, manager of policy and research at the Calgary Chamber of Commerce, was quoted as saying if the city doesn't change the way it grows, it will eventually go bankrupt (can anyone say CALIFORNIA?). If you don't know by now, not only are the suburbs unsustainable, they are expensive for tax payers. The infrastructure costs go up considerably, the further out you build. Until we start installing parking meters out there, suburbanites will never know the true cost of their style of living. You're no dummy. You know that all the visioning and planning exercises in the world does not a city make. Implementation is where the real work comes in. An upcoming mayoral election just might be the right place to make sure implementation happens. Just because Plan it did not include the need for engaged citizens doesn't mean you should let them off the hook. How does your candidate intend to implement the plan? If the next 60 years mean anything to you, find out. Now that's smart.